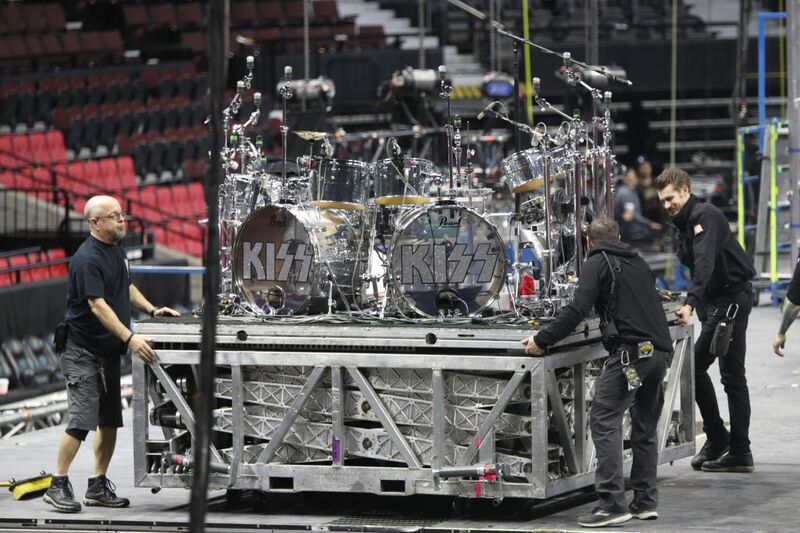 Crew assemble the set and stage for the rock band KISS on April 3. Music industry arts students were invited in the morning to witness the set-up. It’s a sunny but windy April 3 at the Canadian Tire Centre. The ice surface has been dried and countless boxes, pushcarts, girders and cables were moved around by over a hundred crew members, dressed in jeans or sweat suits. What began as a disorganized mess slowly found order as boxes are were emptied, and their contents were assembled into a giant stage. The girders are connected to form rigging and expensive lights are hung beneath with precision before being hoisted high into the arena by dozens of cables attached to the roof earlier that morning. It takes around eight hours for this massive operation to transform from organized chaos into a nearly complete rock stage. The crew is professional. They’ve done this hundreds of times. They are the crew for KISS; here to make this a memorable performance. “I feel like the people who are going to watch the show, they do not realize all the effort and the work put together before it,” said intro to music arts student, Kebi Lozi. Around 11 p.m., the students were visited by Chad Guy, the advance production manager of KISS, and other production heads including: Sean (Motley) Hackett, John McLeish and Robert Long. The students were with the crew for a two hour question and answer period. Other staff members dropped in to give their input before disappearing back into the production. Wood has been organizing visits by his class to various events since the start of the program in 2007. He had contacts in the industry from his days touring in a band. The first class had to opportunity to watch the set up for Avril Lavigne as she prepared for her performance at that year’s Juno Awards. Since then the class has been invited over the years to see the set-up for various acts: Bob Seger, Hedley, Sean Mendes, Carlos Santana, and the 2017 Juno Awards. With the stage set-up mostly complete, the music industry arts students began to wrap up their day and return to the college. Laurin said he would consider being part of an operation like this in the future. “It would probably be a good experience,” he said. Music industry arts program gets KISSed Reviewed by Mike Athey on April 16, 2019 .